‘PONTIANAK’ IS ONE AMONG THE NUMEROUS VAMPIRE-GHOSTS that thrive in Malay folklores and is commonly described as the ghost of a woman who died in childbirth, often taking on the guise of a scented, seductive girl. Sumpah Pontianak is the third in a trilogy of Pontianak-themed horror movies that capitalised on the local population’s fear for this most treacherous of vampires. The ‘Pontianak’ in the third installment, though, is a benevolent one who rescues her daughter and kampong dwellers from the threats of other devilish creatures. 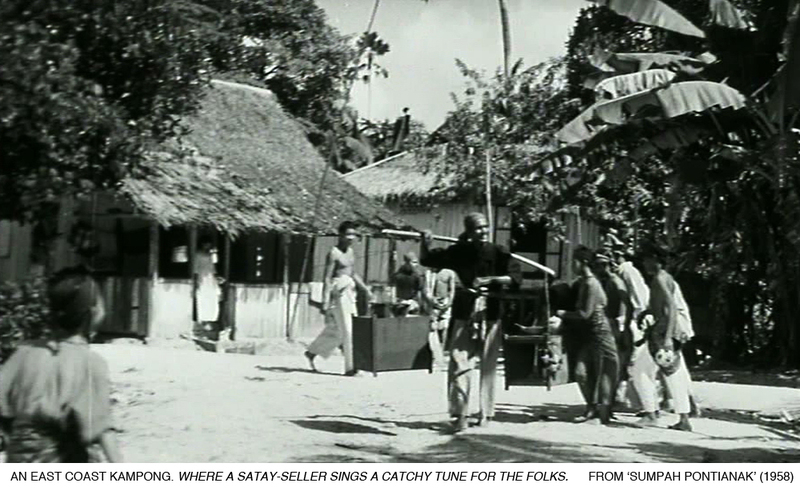 Actor Wahid Satay, who provided comic relief in the trilogy as a singing satay-seller, once revealed that the movies’ exterior scenes were filmed in kampong vicinities of Siglap, Padang Terbakar and Tanah Merah, all situated along Singapore’s eastern coast. They provided excellent rural settings for the films’ supernatural antagonists to perform their homicidal feats and induce panic in the fictional neighbourhoods. In the real world, little did the kampong residents expect that they would soon be facing something more haunting than pontianaks: the bulldozers summoned by government authorities to demolish their houses, beginning from the 1970s, up to the 1980s. 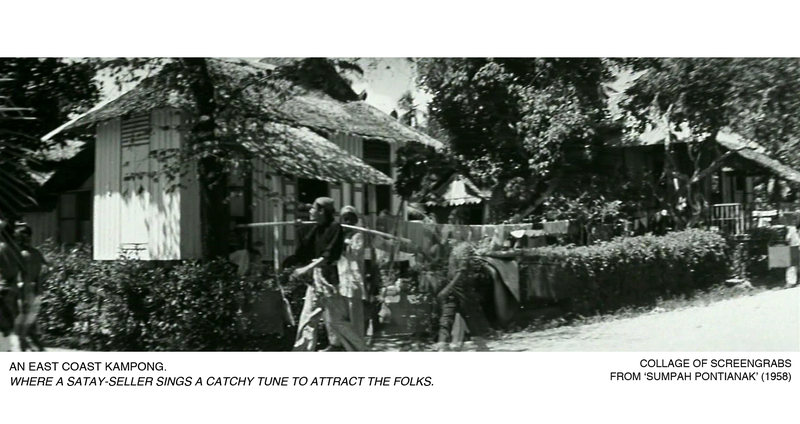 These last surviving traditional (fishing) kampongs and their well-established communities were destined to make way for urban redevelopment – a comprehensive reinvention of the landscape to suit the needs of a modernizing, forward-looking industrial society. According to Malay legend, there were dark thunderclouds (or a solar eclipse according to other accounts) when a Malay chief from Sumatra, Tok Lasam, landed in the area during the 1820s. 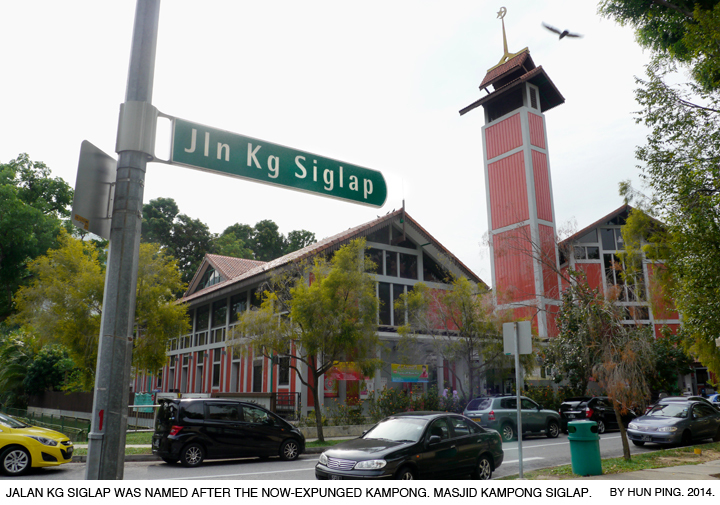 This led people to call the place ‘Siglap’ (derived from the Malay word ‘gelap’, meaning ‘darkness that conceals’.) Others attributed the kampong’s name to the overabundance of trees in the area, which allowed very little sunlight into the village, thus resulting in a “very dark” living environment. 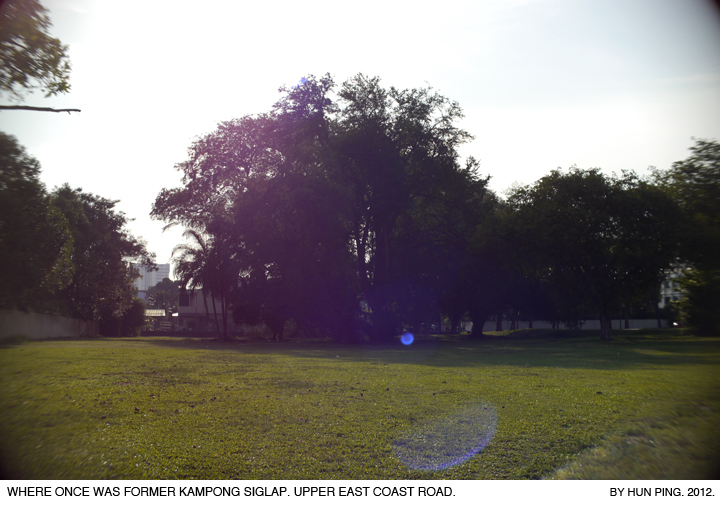 In the middle of 1985, the remaining villagers of Kampong Siglap (it grew to 346 families) were resettled once and for all; the kampong was demolished entirely and cleared the way for new residential developments by private property developers. Tanah Merah Kechil means ‘small red earth’. The name ‘Tanah Merah’, which had appeared on maps of Singapore as early as the 17th century, is derived from the red lateritic cliffs found along the east coast that were visible from the sea. 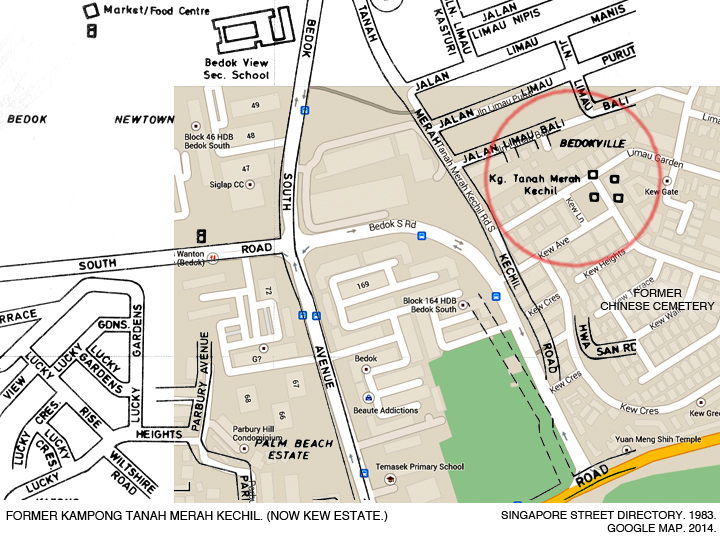 Cartographers of early Singapore maps even identified two areas with such distinctive geographical features – ‘Large Red Cliff’ (Tanah Merah Besar; in the Changi area) and ‘Little Red Cliff’ (Tanah Merah Kechil; in the Bedok area). 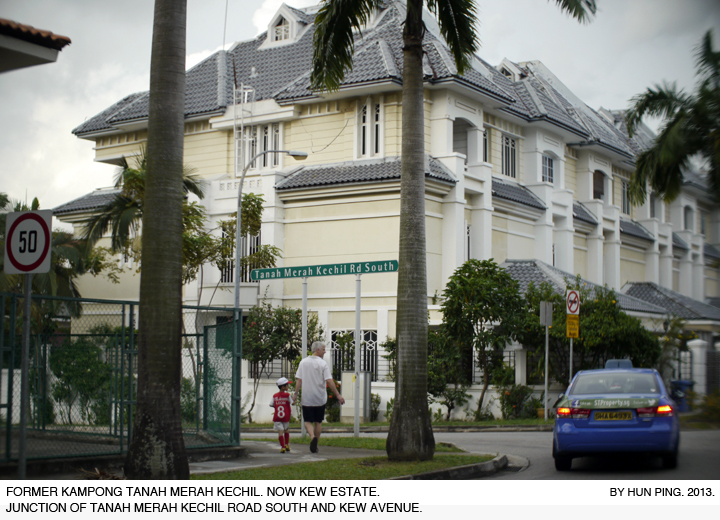 Kampong Tanah Merah Kechil was named after the road that ran beside it – Tanah Merah Kechil Road. 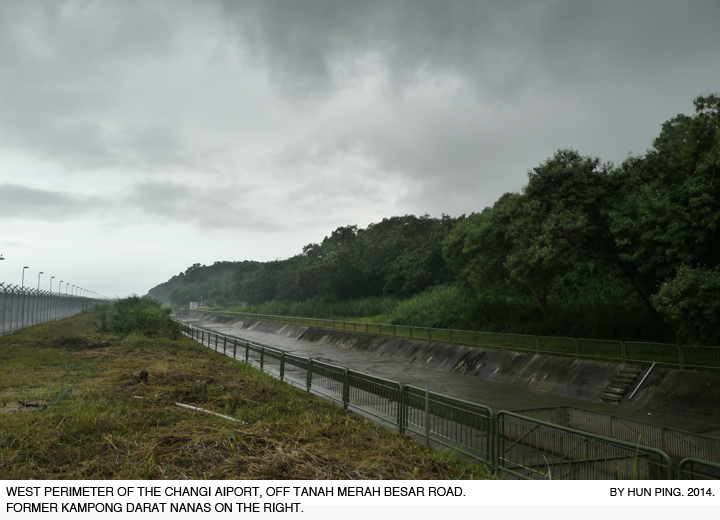 The road itself was so named because it stretched from Upper Changi Road to the seafront, winding its way along the contours of the ‘little red cliff’ just off the coastline before meeting Upper East Coast Road. 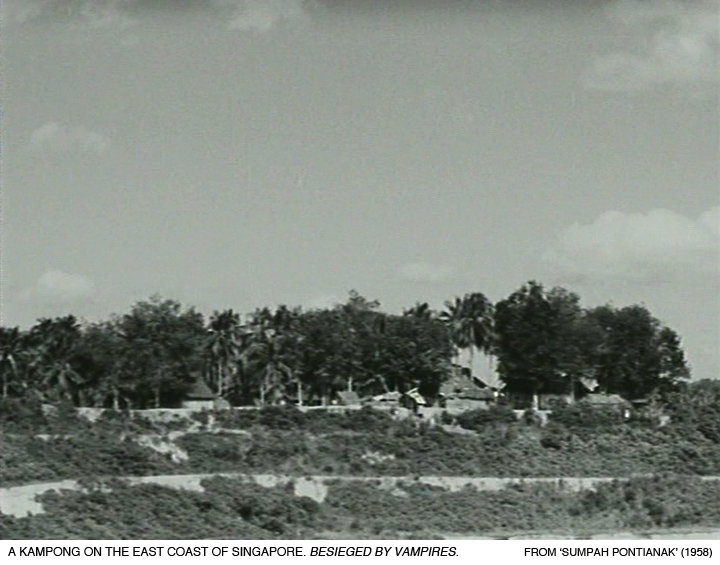 The ‘little red cliff’ (or Bedok Hill) was partially leveled in 1963, the soil being excavated to fill the sea for a Pilot Land Reclamation Scheme at Bedok; approximately 19 hectares of land reclaimed from the sea between Wyman’s Haven restaurant and Bedok Corner. Padang Terbakar (which means ‘burning field’) derived its name from a field that often caught fire in the hot season every year. Others recalled that a Siamese businessman used to own that place which was near the beach, and villagers would burn the lallang and wood there so that they could collect the burnt wood for use or sale after the fire. 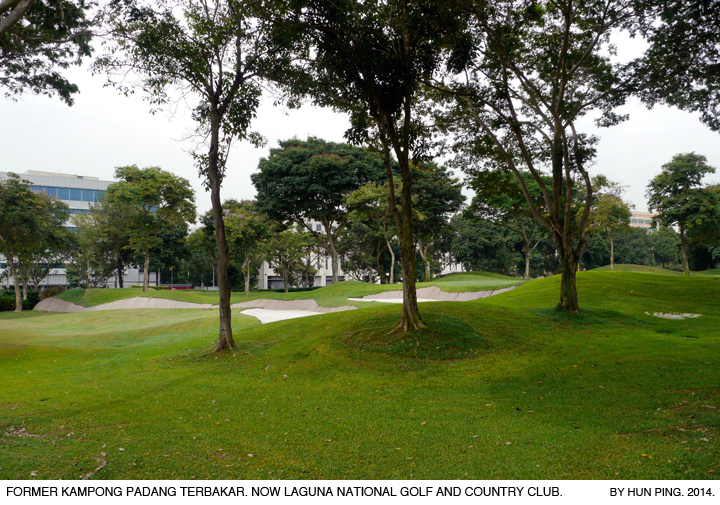 The name ‘Padang Terbakar’, according to a former resident Hafiza Talib, has been in use since 180 years ago. 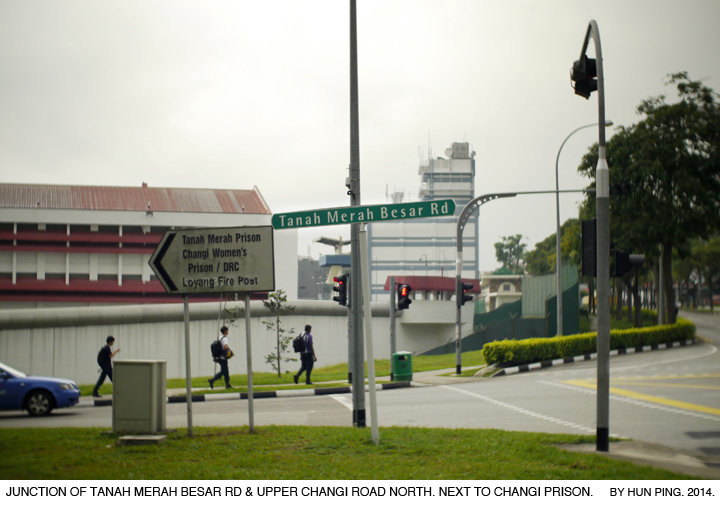 Located off Tanah Merah Besar Road (a road named after the original ‘large red cliff’ in the vicinity) and known for being the kampong “behind Changi Prison”, Kampong Darat Nanas (or Darat Nenas) probably got its name from the pineapple plantation that existed in the area during the early 1900s.It was not known when the kampong was founded, but its population increased most significantly after the war, during the 1950s. 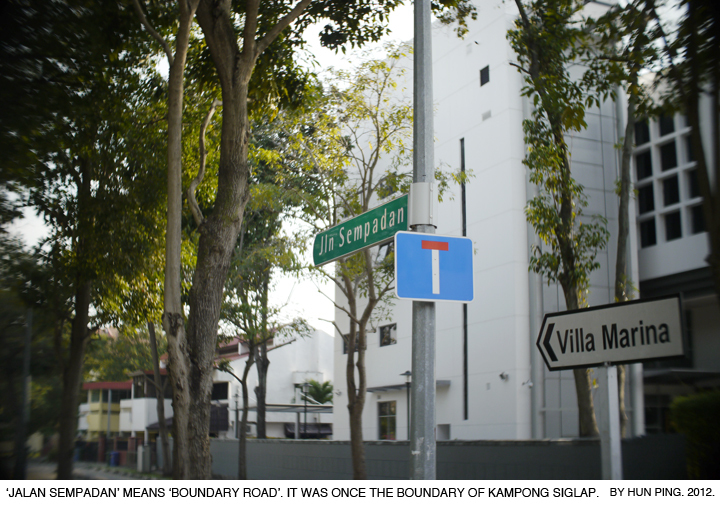 In 1984-85, the kampong’s residents were forced to move out and be resettled to HDB flats. 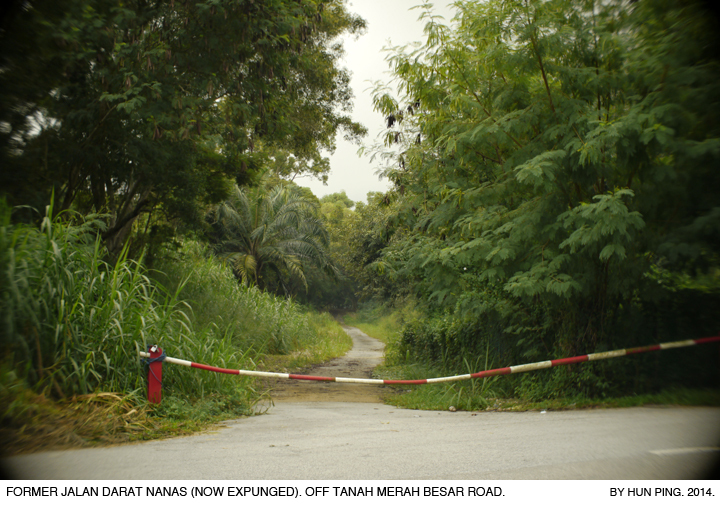 Kampong Darat Nanas shares a similar fate as Kampong Padang Terbakar – no physical traces of it remain, other than the overgrown road that was formerly named after the kampong (Jalan Darat Nanas; it had already been taken off maps and street directories). 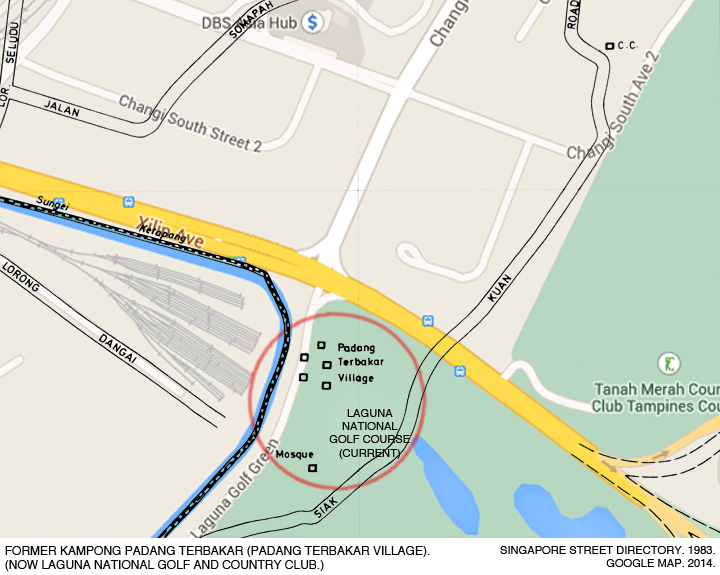 Large portions of the kampong’s former site remains undeveloped for now – an MRT train tunnel is beneath it; the now-forested site appears to be sandwiched between the Changi prison/aviation industrial estate (JTC-built) and a Public Utilities Board (PUB) canal that runs parallel to the west perimeter of the Changi airport. 1. ‘Truth about Pontianak’. The Singapore Free Press. 18 May 1957, p. 3. 2. 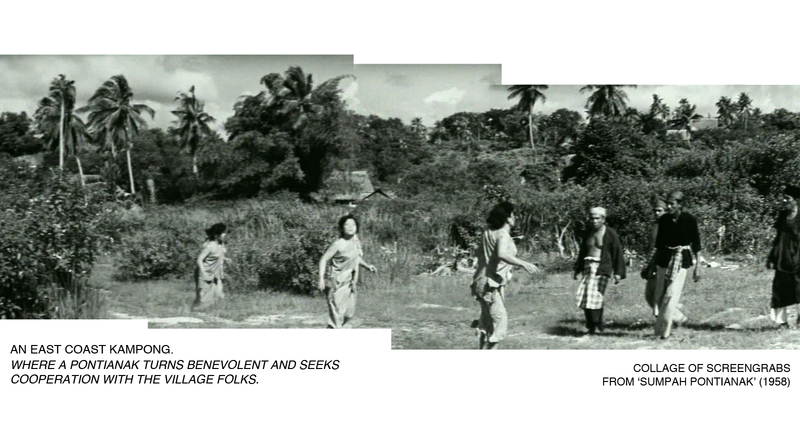 ‘‘Sumpah Pontianak’ Film Melayu Cinemascope Yang Pertama’. Berita Harian. 31 January 1958, p. 7. 3. ‘Interview with Wahid Satay’, Cinematheque Quarterly Jul-Sep 2013 (pp. 42-53). National Museum of Singapore, 2013. 4. Mohd Anis Tairan, Kampungku Siglap: memoir Mohd Anis Tairan. Singapore: Majlis Pusat Pertubahan-Pertubahan Budaya Melayu Singapura, 2010. 5. Hafiza Talib, Nostalgia Kampung Padang Terbakar. Singapore: Hafiza Talib, 2013. 6. Yeo Hong Eng, The Little Red Cliff. Singapore: Trafford, 2013. 7. 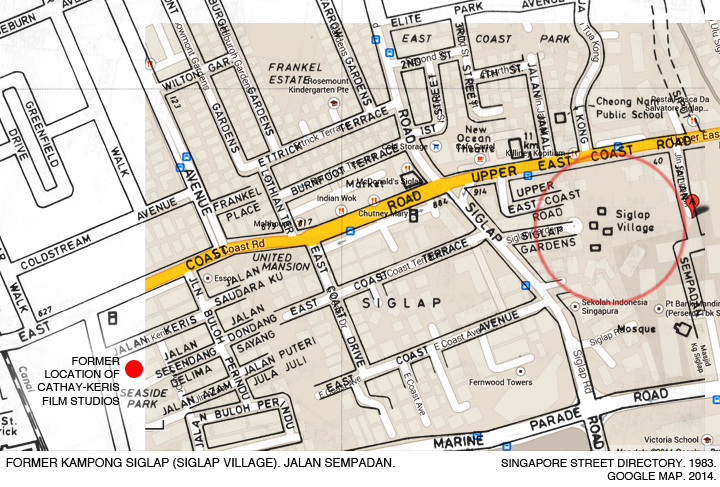 ‘New Siglap housing estate opens’. The Straits Times. 20 March 1964, p. 6. 8. ‘Siglap: time and tide leave a fishing village behind as progress puts the seafolk out of business’. The Straits Times. 17 November 1970, p. 6. 9. ‘How Singapore will grow another two sq-miles’. The Straits Times. 2 March 1971, p. 18. 10. ‘Changi projects ahead of schedule’. The Straits Times. 28 November 1976, p. 11. 11. ‘Readers dispute origins of place names’. The Straits Times. 25 November 1979, p. 12. 12. ‘Pasir tidak lagi putih di Kg Padang Terbakar’. Berita Harian. 18 March 1984, p. 3. 13. ‘End of a CC and a way of life’. The Straits Times. 5 February 1985, p. 14. 14. ‘346 families to be resettled’. The Straits Times. 27 March 1985, p. 14. 15. ‘Nama diambil dari ladang nanas’. Berita Harian. 2 June 1985, p. 3. 16. ‘Two miss kampung spirit and fun’. The Straits Times. 9 June 1985, p. 17. 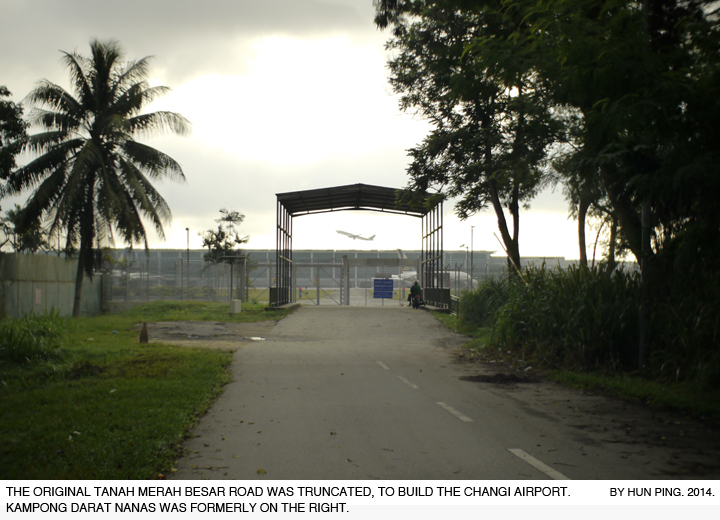 I see no entry for Pontianak, but according to Mr. Wahid Satay in an interview (reel 1) in the oral history archives, the Pontianak movie was shot in part at Kubur Kassim near the Opera Estate. Thanks Masya. I’ve never watched ‘Pontianak'(the 1st film in the trilogy), and it’s presumed lost now. Such a pity. 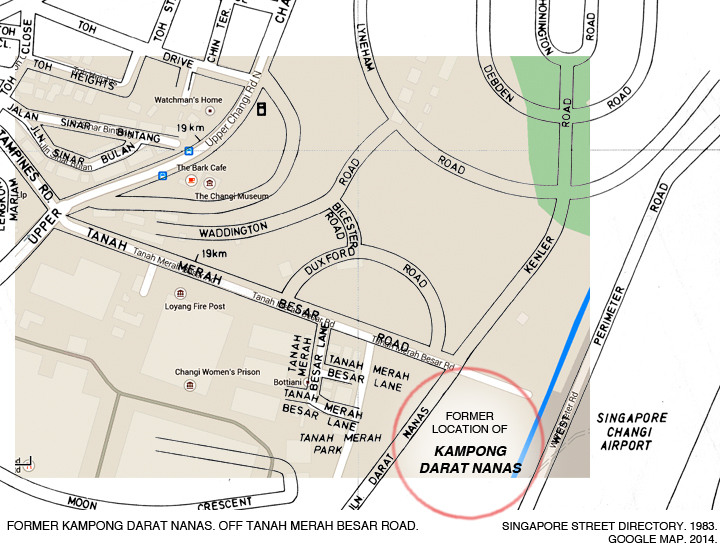 I can imagine the film crew shooting at Kubur Kassim, which was in the vicinity of the Cathay-Keris studio. I visited it twice. Unique atmosphere. They ought to preserve the place!